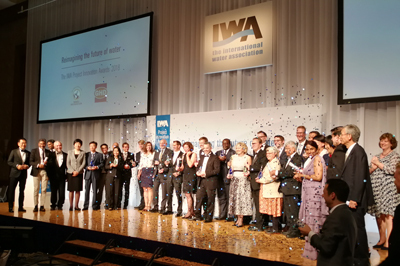 Aqua-Q is the gold winner in the category Market-changing Water Technology and Infrastructure at the IWA Project Innovation Awards in Tokyo, September 2018. 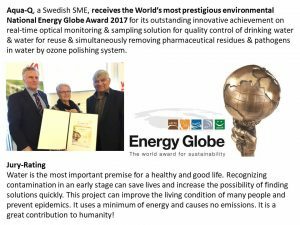 Aqua-Q is the Swedish winner of Energy Globe Award 2017 for AQUATRACK®, Early Warning System for pathogens & Ozone Polishing for elimination of pharmaceutical residues and pathogens at the same time. the field of application with high market potential. Aqua-Q a Cleantech applied research company from Stockholm with many years of experience from the Swedish water and waste water municipal treatment plants and has developed the world’s first on-line monitoring and sampling Early Warning System, AQUATRACK® for drinking water in Sweden. AQUATRACK® for the monitoring of water for reuse, recycling, treated waste water, source water and drinking water is a Swedish innovation and is an unique Internet-based communication system that can quickly communicate with various agencies and water operational managers. The system is a fully automated, accurate, fast and sensitive measurement system that operates 24 hours a day 7 days a week. The system provides preventive information on technical breakdown, infiltration of surface water, overflow of treated and untreated waste water into collecting systems and changes in water quality that may present a risk of biological growth and chemical contamination in water production and distribution process. AQUATRACK® saves energy and protects the environment. Participates in EU-India water cooperation project. 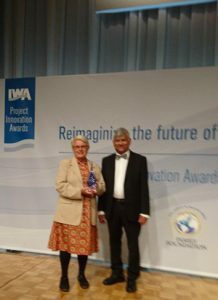 Received IWA gold prize for best innovation for Market-changing Water Technology. Aqua-Q will participate in Porto Innovation Week September 24-30.